A visa is a document entitling the holder to enter a country. A visa is either a stamp or a sticker in the passport and is made according to international regulations. According to international agreements, when a citizen of one country wishes to travel to another country, he or she first has to obtain a visa from the consulate or consular section of the embassy of the country is going to visit. If permission is granted, a stamp or sticker is affixed to his or her passport and he or she may travel to the country of destination. Although basically a visa has to be obtained before travelling to a foreign country, some countries have mutual agreements of visa exemption for their citizens and some countries allow citizens of some countries to enter without visa. Thailand uses a mixed three way system, viz. Persons who are exempted from visa requirements to enter Thailand, which applies mostly to citizens of developed countries with adequate standard of living who enter Thailand for short-term visits as tourists for not more than 30 days. The visas issued by the Thai government are based on the authority of the ministerial law, which the minister of the Interior, based on sections 5, 12 (1), and 34 (15) of the 1979 immigration act, issued and transferred the executive power to officials of the Ministry of Foreign Affairs and immigration officers under the control of the National Police Bureau, from the date of enforcement of the 1979 immigration act to the present. The Ministry of the Interior issued ministerial laws defining 9 types of visa, some of which are issued only to holders of diplomatic or official passports, while others are issued to persons wishing to enter and temporarily stay or enter and take up residence in the kingdom. The different visa types entitle their holders to different rights concerning the length of stay in the kingdom and visa fees that vary according to the type of visa. Non-quota immigrant visas are issued to foreign residents of Thailand who wish to travel abroad, similar to re-entry permits. This type of visa is stamped in the passport and must be used together with residence documents and endorsed each time the holder enters or leaves the kingdom. The fee for this type of visa is 1,900 baht for one entry and 3,800 Baht for multiple entries within a specified period of time. Immigrant visas under section 41 are theoretically issued to foreigners who have obtained permission to permanently reside in the kingdom by the immigration consideration committee according to the agreement of the minister in charge, but presently this kind of visa is not issued as there are no cases of foreigners receiving residence permission through embassies abroad. Applications have to be made after arriving in Thailand. Transit visas are issued to foreigners passing through Thailand. Application procedures are the same as for tourist visas, but the period of stay and visa fees differ. On arrival, holders of transit visas are admitted for 30 days in the kingdom and the stay may be extended by another 30 days (as with tourist visas, citizens of Sri Lanka, Bangladesh, India, Pakistan, Iran, Nigeria, Togo, and Uganda are granted extensions of only 7 days). If there are strong reasons, long term extensions can be obtained as for tourist visas, but application for a work permit is not possible. Transit visas may be changed to non-immigrant visas if need arises. Non-immigrant visas can be obtained by foreigners wishing to enter Thailand for various purposes at Royal Thai embassies or consulates abroad. The purpose of visit must be stated in the application form. The visa will be marked with an English abbreviation as specified by the government accordingly. 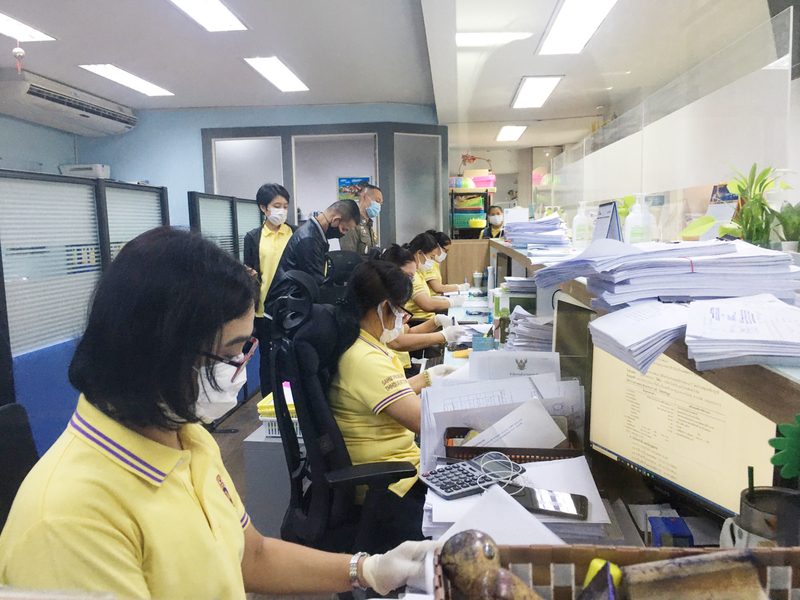 This is done to make the purpose of visit known to the immigration officers from the very time of arriving and to record statistics of foreigners entering Thailand. i.e. application for a work permit depends on the visa, which must not be a tourist or transit visa. A foreigner wishing to apply for a non-immigrant visa must contact a Thai embassy or consulate abroad, fill in the application form and state the purpose of his visit as mentioned above. As this type of visa is of special importance being the only kind of visa that enables its holder to apply for a work permit and long term extension of stay in the kingdom as necessary, presently Thailand uses stickers in the passport for this type of visa, although some consulates, mostly honorary consulates, still use a stamp affixed to the passport. There is no difference in the validity of the visa whether it is a sticker or a stamp. The visa type and class is clearly stated on the sticker or stamp, e.g. NON-IMMIGRANT VISA class B for business, class ED for education and O for other purposes, according to the list given above. The date of validity stated on the visa is often misunderstood as permission of stay in the kingdom. In fact the date of validity indicates the period within the visa must be utilised entering Thailand. If used within the validity period, the visa entitles its holder of an initial stay of 90 days in the kingdom from the date of arrival, even if he arrives on the last date of validity of the visa. In addition, if the English words EXTENSION OF STAY NOT PERMITTED/NO EXTENSION OF STAY are written on the visa stamp or sticker, the holder may after the initial admission period has elapsed, apply for an extension according to his individual reasons and necessity. If the officer in charge agrees with the stated reasons and necessity and the applicant fulfils the specifications set by the Immigration Bureau, the stay may be extended accordingly. This visa type, as its name states, is issued to foreigners entering Thailand as tourists. Like the non-immigrant visa, this visa type must be obtained abroad before travelling to Thailand. Upon arrival a stay of 60 days will be granted, which may be extended by another 30 days (according to Immigration Bureau policies, citizens of Sri Lanka, Bangladesh, India, Pakistan, Iran, Nigeria, Togo, and Uganda are granted extensions of only 7 days). This type of visa may be extended to long term stays of up to one year according to the authority given to the director general of the Police Department (presently changed to commander-in-chief of the National Police Bureau) to consider and approve extension s of not exceeding one year at a time (according to section 35 of the 1979 immigration act). Holders of this type of visa may not apply for a work permit. Holders of tourist visas may apply to change the visa to a non-immigrant visa if they wish to work in Thailand or are afraid that they may not be granted a long term extension of stay without non-immigrant visa. Courtesy visas are issued free of charge to holders of official passports who travel to Thailand as tourists for a period not exceeding 30 days. Diplomatic visas are issued to holders of diplomatic passports entering the kingdom to perform their assigned duties free of charge by Royal Thai embassies or consulates abroad. In the case of countries with which Thailand has made visa exemption agreements, the holders of diplomatic passports may enter Thailand without a visa and will be allowed to stay in the kingdom for an initial period of 90 days. Official visas are issued to holders of official passports free of charge. The procedures and exemptions are the same as for diplomatic visas and the initial period of stay is 90 days.